Area IT Outsourcing, San Francisco Bay Area for 30+ Years! 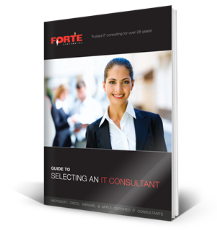 "I'm happy to recommend Forte to anyone looking for an IT consultant." We know that the internal staff at many businesses are fully occupied with just keeping things running. IT support and ongoing IT initiatives necessary to maintain competitive advantage languish due to a lack of internal resources. Forte can also provide temporary staffing with the specialized expertise for your projects for a fraction of the cost of carrying them as full-time employees. Save time and money and access engineers who are up to date with the latest technologies. Save money by avoiding full-time hiring and contract our certified engineers instead. Save the cost of training your internal staff by bringing in our certified experts. Save time by eliminating long, drawn-out interviewing and hiring processes. Our certified engineers are available right now and can start on your project immediately. Get the expertise you need by bringing in our certified, seasoned experts. Don’t have the time or process in place to manage a large project? Don’t worry, we can take on as much of the project as you like, relieving you of the pressure. From design, to planning, management, and implementation, we can do it all for you. If you prefer to have your internal staff handle your projects, Forte can back fill their positions for the duration of the project. We have engineers fully versed with ticketing systems and change controlled environments, including FDA and SOX. For more than 30 years we have provided project engineers and staff augmentation for businesses of all sizes throughout the San Francisco Bay Area. Call or email us to learn more!